Oil on canvas, 49 x 62 cm. 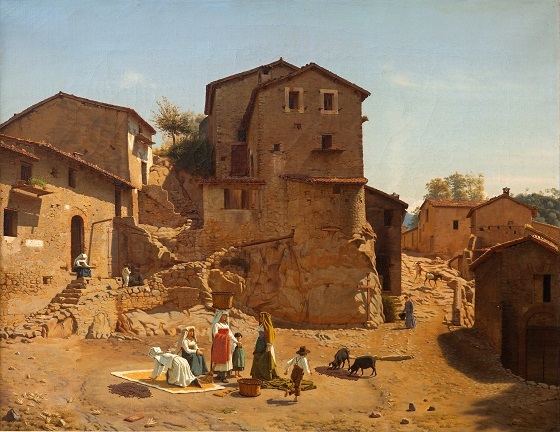 With the help of a grant from the Danish Royal Academy of Art, Frederik Vermehren journeyed to Italy in 1855, where he painted landscapes, figure studies and streets from Italian villages. In this painting, the artist has sought to capture the strong light of the Mediterranean sun and how it highlights the surrounding architecture of the main square in Gerano. The people on the square show that Vermehren also had an interest in depicting the locals’ daily lives and labours. A group of locals have set up a temporary shop on the square selling clothes and edible mushrooms. An interested customer has stopped to examine the goods, while a boy runs towards two pigs eating the traders’ fruit. This scene from Gerano can be considered a cross between an architectural study and genre art.